If you yearn for a kid-and-husband-free tropical trip with your BFFs, then pack your bags for the Beaches Friends Forever Girls Getaway at Beaches Turks & Caicos Resort Villages & Spa. Located in Providenciales — the most developed of the 40 islands and cays in the Turks and Caicos — Beaches Turks & Caicos was voted “Best All-Inclusive Resort” by Caribbean Travel + Life magazine and is the perfect setting for a fun-filled girlfriend or mother-daughter getaway. Now in its fourth year, the BFF Girls Getaway gives women from different walks of life an opportunity to bond with their buddies and make new friends. The four-night, girls-only trip kicks off with a private welcome cocktail reception and fashion show. If health and fitness is your priority, each morning begins with a 45-minute seaside meditation class with Yoga Spirit instructor Kim Valeri, followed by a 60-minute, gentle yoga class. Each BFF participant receives a beach swag bag packed with goodies, including beauty products, magazines and a $200 gift certificate for the resort’s ambient Red Lane Spa. Treatments include the 50-minute Lively Up Coffee Wrap, an anti-aging and anti-cellulite wrap using stimulating green coffee beans from the island hillside, and the 80-minute Recovery Lane Treatment that combines a cleansing facial, back exfoliation and tension-taming massage. Although it may not be a smooth voyage if you’re prone to seasickness, one of the most popular events on the BFF itinerary is a three-hour catamaran cruise. On-board, the women sip rum-infused cocktails and dance to reggae and hip-hop music, while some even flirt with the friendly, male members of the boat staff. The highlight, however, is when the boat docks at a private beach to watch the tangerine sunset. Denise White from Silver Spring, Maryland, came on the inaugural BFF getaway by herself in 2008. In spring 2012, she returned with a group of friends, who like her, were celebrating their 50th birthdays. “[It] gives women a chance to do things for themselves they wouldn’t ordinarily do, like take a yoga class or go to the spa,” says White, who likes the diverse group the trip attracts. Beaches’ scenic 12-mile beach lapped by turquoise blue water is the main attraction. Another perk to vacationing at the all-inclusive resort is that the food and premium drinks are good and plentiful. With 16 international restaurants and 12 bars, ranging from the breakfast buffet options at Reflections (tasty offerings include fluffy French toast, mouth-watering omelets, assorted pastries, fresh fruit and oddly enough, savory stewed cabbage) to a fresh antipasto bar at Mario’s and satisfying fast-food treats like burgers, fries and onion rings at Bobby D’s and brick-oven pizza at Bella Napoli Pizzeria. The lush, sprawling resort is divided into three distinct villages — the Tuscan-style Italian Village, the chalet-reminiscent French Village and the colorful Caribbean Village. 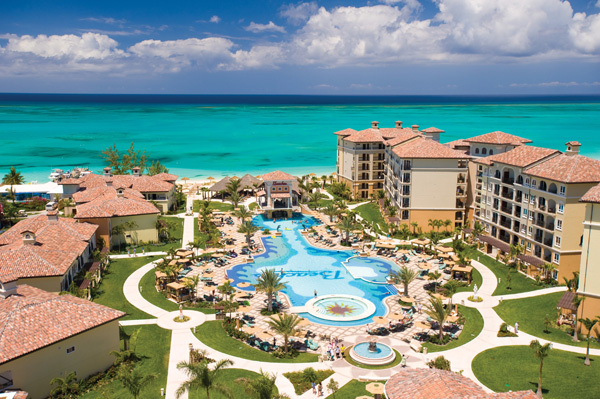 The centerpiece of Beaches Turks & Caicos is the Italian Village, the resort’s newest addition adorned with terra-cotta rooftops, palm trees, dramatic fountains and statues and a huge, heated pool and hot tub. Rooms are accented with mahogany furnishings and marble tiles, and suites are divided into a kids’ section with bunk beds, game table, closet and a small flat-screen TV in the front and a master bedroom with a king-sized bed, daybed, dresser and a larger flat-panel TV. Rooms also have a microwave and mini-refrigerator stocked with water, soda and spirits at no additional charge. Afternoons are free to do as much or as little as you like. The beach is lined with beach chairs and umbrellas — an ideal spot to sunbathe or lounge with a book. If you’d like more active fun in the sun, Beaches offers the Caribbean’s most comprehensive resort scuba diving program, and diving excursions for beginners and certified divers are part of the all-inclusive package. There’s also a modern fitness center and the 45,000-square-foot Pirates’ Island Waterpark is a must for guests of all ages. Other activities on the BFF schedule include skincare demos by Dermalogica, a cheesy-good time Beach Bonfire PJ Party sponsored by Harlequin featuring chocolate martinis and desserts and a lively farewell dinner at the hibachi-style Japanese restaurant, Kimonos. The Liquid Nightclub is also open nightly for after-hours partying. If you’d like to getaway with your girlfriends, there are several upcoming BFF Girls Getaways with rates from $1,299 to $1,399 per person, not including airfare. To book your trip, visit www.beaches.com/bff or call 1-800-BEACHES.